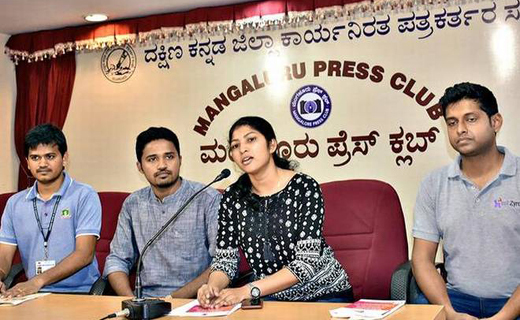 Mangaluru, Apr 11, 2019: Dreamsoft Innovation, Mangaluru, in association with Sahyadri College of Engineering and Management, and HostZro is organising a coding hackathon and gameathon on April 13 and 14 at Sahyadri in Adyar near here. Dreamsoft co-founder Sachin Ganesh told reporters here there will be other gaming events. The State government’s New Age Incubation Network too is joining hands to organise the event. He said the event, ‘Dreamathon 2k19’, is a coding fest for students, professionals, start-ups and tech communities. Co-founder Divya said the participants can network with firms and get internship and job opportunities. Hackathon is a 24-hour event where participants will have to develop a web or mobile app on a topic with the winner getting Rs. 50,000 in cash prize and internships. The junior category is for students of classes 10 to 12, and the senior category is open to all students, corporates, and freelancers between 18 and 24 years.